BP PLC, Europe's second-largest oil company, said Tuesday that first-quarter profit more than doubled from a year earlier to $6.1 billion due to higher crude prices and lower production costs and taxes. Despite handily beating analysts' forecasts, BP shares fell slightly Tuesday as the market continued to worry about the impact of the oil spill from the sunken Deepwater Horizon rig which BP operates in the Gulf of Mexico. BP's net profit compared with $2.6 billion in the first quarter of 2009 and $4.3 billion in the fourth quarter. Replacement cost profit, a key oil industry measure, rose 62 percent to $5.6 billion from $3.4 billion in the fourth quarter and $2.4 billion in the first quarter a year earlier. Revenue of $74.4 billion was up 1 percent from $73.6 billion in the fourth quarter and 55 percent higher than revenue of $48.1 billion a year earlier. The quarterly dividend of $0.14 a share was unchanged from a year ago. "As strong as this performance was, we expect near-term sentiment toward BP to be dominated by the sinking of Transocean's Deepwater Horizon rig and BP's efforts to contain the subsequent spill. This issue aside, we still see better momentum and value in Royal Dutch Shell," which reports results tomorrow, said Gordon Gray and James Evans, analysts at Collins Stewart. BP shares were down 0.6 percent at 622.8 pence on the London Stock Exchange. They traded at 655.4 pence on the day before the oil rig disaster. "Progress has been driven by a near doubling in the oil price, a 3 percent reduction in unit production costs, along with favorable accounting effects and a lower tax bill," said Keith Bowman, analyst at Hargreaves Lansdown Stockbrokers. 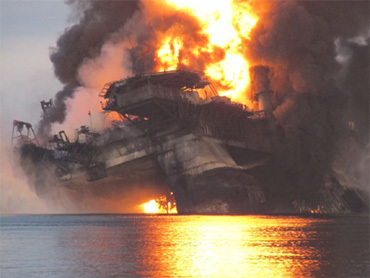 "On the downside, the accident in the Gulf of Mexico continues to overshadow, while refining remains challenging and group production levels flat," Bowman added. Oil prices in the first quarter averaged $76 a barrel compared to $41 a year earlier. On Monday, light sweet crude traded at around $84 a barrel. Production for the quarter was 4 million barrels a day, broadly unchanged from a year earlier, but BP repeated earlier guidance that it expected full-year production to be down slightly in 2010.